The brush strip is a popular, simple garage door seal. It will be effective in keeping out those unwanted things like draughts, leaves and pests. They are straightforward to fit and make your job easier as a garage owner, as your brush strip garage door seal will ensure your garage stays warm and tidy. 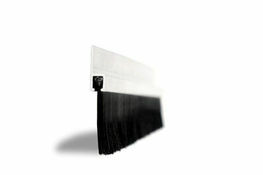 25mm black nylon trim x 2.44m overall length, supplied with 180° aluminium carrier as shown. This product is also available with 90° & 45° carriers if required; for alternative carrier angles, please select from the options menu.